On weekdays I find it hard to get dinner on the table – and forget about trying new recipes. Here’s how my week of meal planning usually goes: browse FB feed, pin delicious looking dishes into a “recipes to try” board on Pinterest and then promptly forget about them forever. Our meals at home were in a serious rut. We fell back on the same rotation of dinners every week. As food lovers, but average home cooks, we were looking to eat better-tasting, healthier food at home, but were overwhelmed by options and effort required to change up our routine in the kitchen. 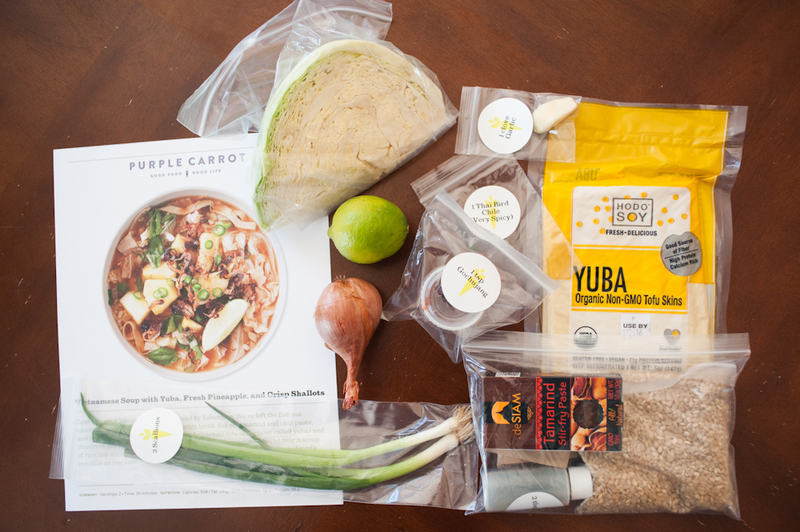 We were prime targets for a meal delivery kit service, but it wasn’t until I read all the press surrounding Mark Bittman’s arrival at Purple Carrot that I thought about giving one a try. The main attraction to Purple Carrot was Mark Bittman’s recipes. Straightforward and flavorful, I was familiar with his cookbooks, books and NYT articles. Still, Purple Carrot is a VEGAN meal delivery kit. I had no strong desire to go vegan, but for just 3 dinners a week, eating a few plant-based meals didn’t seem impossible. I thought we might try it for a week or two. Our food shipment and recipes arrived on our Connecticut doorstep every Tuesday. Shipped on Monday afternoon (from Needham, MA), the delivery was packed in a sturdy box with an insulated bag able to keep its ingredients cool, even if left out on the doorstep. I’d immediately unpack my shipment, survey the week’s ingredients, see what was most perishable, determine which recipes were more challenging and then planned accordingly with my weekly evening schedule. The delivery kits ships with all the ingredients for a meal, plus printed 8.5 x 11″ recipe cards, featuring step by step photos. 95% of the time, the ingredients are pre-measured. There are 3 exceptions you need to have in your pantry: vegetable oil, salt and pepper. The vegetable prep can be intensive in some of the recipes. Other tools we found critical: a food processor and a grater. Aside from a break from weekly meal planning, the way I sold myself on Purple Carrot was my desire to learn something new. After a long day, I’m often teetering on the edge of a run for take out. But when you have all the ingredients in your fridge, you have less excuses. Purple Carrot introduced me to many new ingredients, flavors and techniques in two short months, I considered it an immersion course for a new way of eating. If you’ve seen me in-person these last few months, chances are I’ve talked about Purple Carrot, and how it has been an eye-opening experience in our home. Here are my experience, after cooking up 27 plant-based meals. In my previous disappointing attempts to eat something vegetarian, I would try a salad. This was often unfulfilling, as I was hungry shortly after the meal finished. With portioned meals, we found ourselves eating less overall, but still feeling satisfied, despite the lack of meat and dairy. I felt better, happier and satisfied on nights I ate a plant-based meal for dinner. We didn’t eat vegan the rest of the week, so I noticed how much fuller and sluggish I felt after meals with large entree-sized portions of chicken, pork or beef. I learned to appreciate wonders of quinoa, barley, oats, buckwheat, chickpeas. They filled my bowl as a sustaining base and added a nice variation of textures to our meals. This was my other misconception – that vegan food doesn’t taste good. I was pleasantly surprised to find these meals quite flavorful, as the PC recipe creators carefully balance flavor, texture and even plating presentation to make this an appealing alternative to a plant-based diet newbie. Hats off to Mark Bittman and his team. 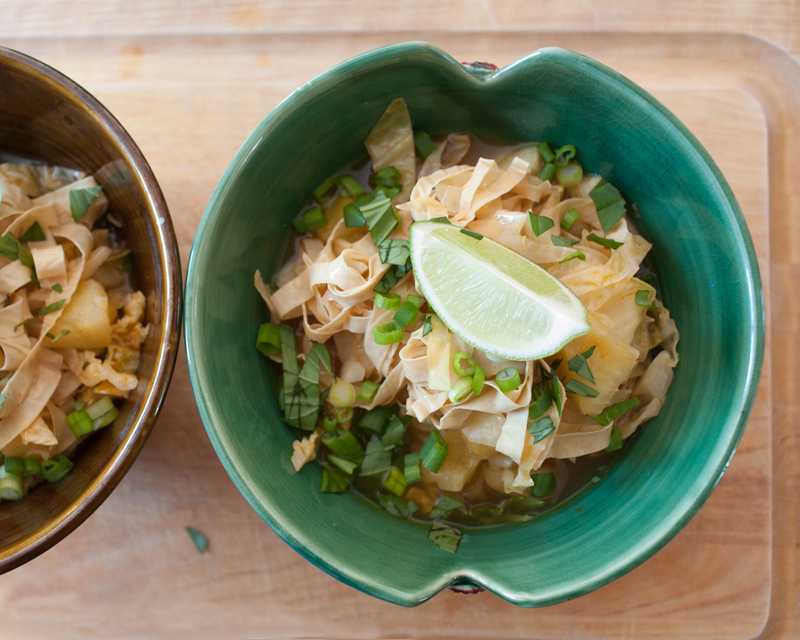 I didn’t love every single recipe, but I found myself experiencing new flavor profiles at home and cooking from other cultures (Thai, Vietnamese, Indian) that had not frequented our kitchen. I’ve also starting to order more vegetarian dishes when we eat out. This would not have have even dawned on me a few months ago. I see vegan options becoming more mainstream (and less stigmatized) and I look forward to discovering more delicious options when dining out in Connecticut. I’ve always loved tofu, but have never liked the flavor or texture of tempeh. I ate it a few times in my college dining hall and concluded that I could never be happy eating as a vegetarian. As a life-long carnivore, a vegan diet was simply beyond comprehension. After trying Purple Carrot recipes featuring tofu, tempeh and seitan as the meat alternative, I realized my disdain for these ingredients was based on my own lack of exposure. I’ll surprisingly admit I’d buy and eat these ingredients again! Paired with the right recipe, I’ve found myself not missing meat. A special shoutout to Oakland’s Hodo Soy, I loved hearing how they are producing handcrafted, organic soy products. I only wish their tofu was easier to find on the East Coast. Meal kits are for busy people who want to expand their cooking repertoire, but lack time or motivation to make it happen. It isn’t for someone trying to save money or to save the planet. There is a lot of packaging. No way around it. You can re-use the various sized Ziploc bags, but the amount of cardboard and plastic that comes with each shipment will probably rattle your conscious. Every delivery kit service is working to minimize it, but if you want convenience – it comes with drawbacks. Often time the bold and exciting flavors from Purple Carrot’s recipes came from small portions of special ingredients like tamarind paste, gojchang, miso, fish sauce and sherry vinegar. Depending on way you cook, your home pantry may not be adequately stocked to handle these recipes. With a meal delivery kit, you can try new flavors without being stuck with a bottle or package of a specialty ingredient that will linger in your pantry or fridge. We also didn’t buy more provisions than we needed for a particular recipe. 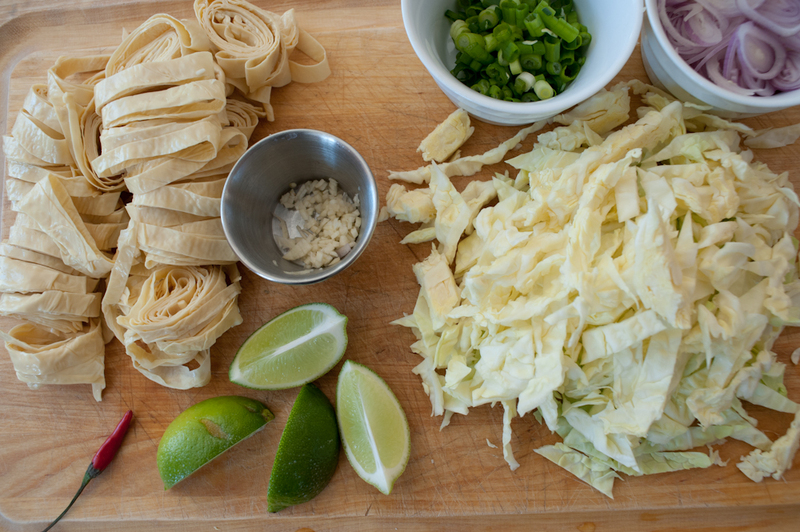 It takes a organized and creative cook to minimize food waste. This is was NOT a strength our kitchen, so there was absolutely less food waste the weeks we cooked with Purple Carrot. Do you still subscribe to Purple Carrot? Sadly, we are not still subscribers. I can imagine reactivating our subscription in the future, as I do miss it. PC recipes required us to up the time we spent in the kitchen and I am proud of what we were able to learn and create. Unfortunately, these same recipes featured too many different textures and flavors for my 2 year old daughter. Hopefully she will grow to appreciate these differences that made me love the PC recipes, but for now, I thought it a serious negative to spend so much time cooking meals that she did not eat. We are not vegans. Purple Carrot provided us with tasty and healthier dinners, but I’m not ready to take this on full-time. Changing my diet is a slow evolution, but this experience has opened my eyes to a world of new possibilities and flavors. I’ve scaled back on my meat and dairy consumption and am open to discovering new plant-based foods. Ever since I joined Purple Carrot, there has been a constant supply of seitan in our fridge and that alone is a radical change in my world of food! You can still try Purple Carrot recipes even if you aren’t ready to subscribe. If you’re still wondering what meal kit might be right for you, there’s a detailed round-up on review.com.